Take a wild guess which one belongs to the main character. An Ace Custom is a piece of technology—a Humongous Mecha, Space Fighter, a particular weapon, or similar— which differs from the normal model because it has tweaks in order to better fit its user. The users are typically Ace Pilots, and their equipment is customized to their specifications—thus, ace custom. The extensiveness of this customization varies widely, from simply giving it a new paint job or Nose Art to actually having a completely unique machine built from scratch. Closely related to the Super Prototype, an ace custom will usually be significantly more powerful than a standard model. Normally, ace customs reflect their user's combat style—a pilot preferring high-speed combat will boost their engine output or add additional thrusters, a gunslinger with Improbable Aiming Skills will add a big gun with scopes and bipods for increased accuracy, etc. This may allow them to be Weak, but Skilled, if their equipment doesn't have as much raw power as their opponent's, but it's so tuned to their strengths that they can compete anyway. It may become so much so that it becomes a case of Only I Can Make It Go. It can also be a case of being a Full Potential Upgrade, if the customizing is required to make the user more effective. Usually it is mentioned the that such modifications, while ostensibly improvements, would add too much cost and complication to mass produce while the Ace is much less inclined to care about such things. May still be shown to have suffered on reliability or simply be considered unsafe if they're regularly pushing design limits. Everyone else just has to settle for the Mook Mobile. If an Ace Custom was made commercially-available, it'll become a Limited Special Collector's Ultimate Edition. Used frequently in the Gundam metaseries, from Char Aznable's iconic red Zaku II in Mobile Suit Gundam to Amuro's custom-build-from-scratch Nu Gundam in Char's Counterattack. ∀ Gundam has an ironic twist, with Gavan Gooney choosing the most distinctive of the Borjarnon units unearthed. Fans would recognize the Borjarnon as the Zaku II from Mobile Suit Gundam, while Gavan's is a Zaku I.
Oddly, the Astray units from Mobile Suit Gundam SEED only had one unit that could be classified as an Ace Custom and it wasn't even part of the actual series, but a case of All There in the Manual. The Astray prototypes from Mobile Suit Gundam SEED Astray on the other hand... Red Frame, Blue Frame, and Gold Frame have been so heavily customized by their respective pilots that they barely resemble the original model anymore (especially the Gold Frame, which, among other things, actually has the Blitz Gundam's right arm that Kira chopped off!). Mobile Suit Gundam Seed CE 73 Stargazer has the Strike Noir, Blu Duel, and Verde Buster, which are essentially rebuilt Strike, Duel, and Buster Gundams upgraded and modified to suit their pilots' combat preferences. Sidestories for it add the Rosso Aegis and Nero Blitz which have the same principle as the first three. Kamille Bidan's Zeta Gundam is a special case, where Kamille essentially designed his own personal mobile suit from the parts up (essentially combining movable frame technology with the Gundam Mk. II) and then began obsessively tuning it to his capabilities. The personal performance tuning becomes a problem when he's out of commission. White Unicorn (likely Amuro Ray) pilots a MSZ-006-3A Zeta Gundam III A Type. Its only visible differences between it and Kamille's Zeta are Amuro's personal emblem and a color scheme associated with him. Grey Wolf's MSZ-006-3B Zeta Gundam III B Type is in a yellow color (much to the pilot's chagrin), has additional airfoils, and a giant beam gun. Red Snake's MSZ-006-P2/3C Zeta Gundam III P2 Type is easily the most unique. It has completely redesigned armor with a spikey motif, a bright red color scheme, and a custom cockpit making it a Mo Cap Mecha. Graham Aker from Mobile Suit Gundam 00 is the king of Ace Customs in that universe, earning him the Fan Nickname "Flagfucker". After his first clashes with the Exia, he has his Flag upgraded with better equipment and when even that isn't enough, he rams a GN Tau drive into his Flag. In the second season, he initially uses a customized Ahead with katana-shaped beam sabers but his next two machines are both one-of-a-kind units visually based on the FlagSPOILER Though it was revealed later in the series that the same were basically built around the Flag's frame. In the movie, he uses yet another Flag-based Ace Custom, the Brave Commander Type, with two drive exhaust units instead of the base model Brave's single unit; this caused some fans to mistakenly assume that the Brave Commander Type has a Twin Drive System when in truth, it simply has two GN Drives. Soma also uses two Ace Customs before her HeelFace Turn: a pink Tieren designed specifically for her and another modified Ahead which becomes a hand-me-down for Louise Halevy. Taken to the logical extreme in Gundam Build Fighters, as to win, one must have a custom model of a suit that likely was already an Ace Custom or Super Prototype in the above series' to even have a chance of winning for the most part. Just piloting a repainted Ace Custom will result in a broken model - just ask that one Legend Gundam that got turned into mincemeat by the Kampfer Amazing. Or the Turn X which got curbstomped by Sazaki's Gyan Vulcan. Gundam Build Fighters is chock-full of Ace Customs, ranging from Gundams (Strike, X, Exia, Master, MK-II, Wing, F91), non-Gundam aces (Sazabi, Zaku II Char Custom, Astray, Qubeley, Turn X) and even mooks (Kampfer, Acguy, Gouf, ZAKU Warrior, GM Sniper, Gyan). 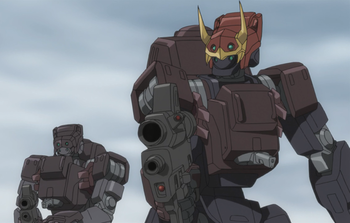 However, both Build Fighters and Gundam Build Fighters Try have examples that go against this trope: both series had a scene where a powerfully-skilled pilot defeated tough opponents in a Jegan (and the first series had the Jegan defeat a Devil Gundam) and Try had the infamous battle between the Build Burning and a straight-assembly (re:built straight from the box with no modifications at all) Destiny Gundam, where both suits were viciously trashed. Try also shows that it's possible to build a champion level Gunpla that's still a non original design, particle tricks and all, with Lucas Nemesis's X1 Full Cloth, which is exactly according to the specs of the manga design (and even had the core fighter that the actual model was supposed to lack), seemingly just because Lucas really liked the original design. It's seemingly all about the internals and quality of the crafted parts, rather than just because you made changes to an existing design. The Build Fighters example above was exemplified earlier in Model Suit Gunpla Builders Beginning G as it was shown that throwing together a suit all willy-nilly will only lead to a suit that'll barely stand up against more experienced fighters. Even the more-realistic Mobile Suit Gundam: The 08th MS Team manages this because of that realism. The normal mobile suits used by the good guys, the RX-79[G] ground-type Gundams, are made out of spare parts from the original series' Gundam. This gives them durability pretty close to the actual Gundam, but also means repairs are difficult at best, and simply trying to keep the things functioning results in two of the 08th team's three Gundams becoming custom units by around the halfway point. A particular example is Shiro's "Ez8" unit, which was a drastic overhaul of his Gundam in a nightmareish attempt to fix it after it got trashed, but nevertheless managed slightly better performance than the standard models because, with the removal of some fixed weapons, there was room to improve the performance of its reactor. Then there's Karen's "GM Head" Gundam, made because the original head was knocked off in an ambush and the easiest way to get it back into the fight was sticking a spare head from a ground-type GM onto it. Given a weird cross with Mook Mobile in the expanded universe material regarding the original anime's Gelgoog. While built as a mass-production unit, it was also designed in close cooperation with several Zeon aces whose advice molded the suit's ergonomics and controls. The result was a mobile suit that was monstrously effective in the hands of an ace, but which novices and even regular pilots found overwhelming and impossible to use at anything like its full performance. Naturally, this shows up in abundance in Mobile Suit Gundam: Iron-Blooded Orphans. Most of Tekkadan's mobile suits are customized versions of captured enemy units, some of which were already customized to begin with. Of particular note is the Ryusei-Go; with its salmon-pink paint job and shark motif, the only way you'd be able to tell that it used to be a lowly mass-production Graze is reading the engine's energy signature. For Gjallarhorn otherwise, they have the EB-05s Schwalbe Graze, which is a Super Prototype itself in contrast to the standard EB-06 Graze. And then there is Graze Ein, which is the pilot himself becoming the Ace Custom. Mobile Suit Crossbone Gundam takes this to parodying lengths with the "B Gundam" - a Ball modified solely with a Gundam faceplate attached. Which actually decreased its performance because of the added weight. And it still ended up with a better kill record than a regular Ball, managing to kill six Rick Doms during the Battle of Solomon. Panzer World Galient: Hy Shaltat's Wingal Zee, which has a silver coat of paint and wields two tomahawks (instead of one, unlike the others panzers). In Knights of Sidonia, Nagate Tanikaze makes consistent use of these, starting with the Tsugumori that is technically an obsolete type 17 but puts greater emphasis on pilot skill than auto pilot, allowing outstanding performance from the ace himself. He later uses the advanced combat prototype and the Tsugumori ll. Super Dimension Fortress Macross has Maximilian Jenius and his wife, Zentradi defector Milia Fallyna, being granted the privilege to give their mechas distinctive paint jobs for being the top pilots of the force. There are two ace custom Valkyries in Skull Squadron; Hikaru's has a triangular visor, two guns and a "chin" (VF-1J), and the Skull-1 has FOUR guns on the head (VF-1S). Both have custom paint jobs as well - Hikaru's is painted in red stripes, and the Skull-1 is painted with black and yellow ones, with prominent skull-and-crossbones. That said, the show still subverts the Ace Custom, as the only unique thing about the performance of either the squadron-leader VF-1J model or the Commander Air Group model (VF-1S) is that they have more laser cannons mounted on the head than the base VF-1A model (and the VF-1S has additional avionics to allow Commander Focker [Commander Ichijo after Focker succumbs to Mentor Occupational Hazard] to handle the CAG's strategic role while in flight). The performance upgrade packs (Super Valkyrie and Armored Valkyrie) can be (and are) applied to any VF-1 fighter. A latter-day Robotech comic reconcepts Skull One as a Super Prototype, possibly due to a misinterpretation of its "001" marking (indicating the CAG's aircraft). Then there's Nekki Basara's VF-19 Fire Valkyrie which pushes the pilot-specific customization Up to Eleven. Beyond the bright red paint job and a different head with a Super Robot style face sculpted on it, it's entirely geared torwards spreading The Power of Rock instead of actually fighting (its gun shoots Speaker Pods that blare Basara's music inside all mechs he hits instead of live ammo, has speakers inside its shoulders for atmospheric musical broadcast, and its only conventional weapons are internal missiles that Basara does his best to never need to use), oh and it's piloted by playing a guitar. Later on when Sound Force is founded Mylene and the rest of Fire Bomber also get their own custom VFs made in a similar vein. Based off of side info like model kit manuals, Brera's VF-27β in Macross Frontier is indeed an Ace Custom, while the VF-27γ piloted by Grace is the "common soldier" version. Tengen Toppa Gurren Lagann has a number of unique mecha, but of particular note are the Four Generals, each of which has a custom mech despite their minions using basic Mook Mobiles. Code Geass features several ace customs. The Knights of the Round are an elite, 12-person ace custom squad piloting highly personal, one-of-a-kind mechs, including the Transforming Mecha Tristan. The Japanese side has the Guren, the Shinkiro and the Zangetsu as their ace customs. The Shinkirou is an interesting case; it's the Ace Custom of Lelouch, who's actually pretty bad at straight combat. However, it's tailored specifically to his strengths, wielding a scattering laser cannon and a Beehive Barrier that require a mind as quick as his to coordinate properly; in his hands it can single-handedly clear an entire battlefield in moments. It also utilizes extremely non-standard controls, which suit Lelouch perfectly but would be actively detrimental to normal (or even ace) pilots. The page image is actually a subversion; though it's given a fancy head ornament, Lelouch's first Knightmare is a standard rank-and-file Knightmare due his only above average piloting skills compared to the real ace of his forces. It's just given a distinctive look so that his army knows he's there fighting alongside them, per his philosophy. Played with in Legend of Galactic Heroes: admirals on both sides get ace custom flagships, which tend to be slightly more powerful than their factions' regular fleet ships and serve as Ships of the Line in their Standard Sci Fi Fleets, but where Imperial flagships are indeed one-off ships that often include new technology (through a few models have indeed a limited production), Alliance ones are mass-produced battleships of models made specifically for the job, with only the Triglav and the Leda II being unique due being the first ones of new advanced classes that end up never being mass-produced. In Lyrical Nanoha, the TSAB's mooks use relatively standardized Storage Devices (spear-like ones for the melee-oriented Belkan style and staves for the range-oriented Mid-Childian style), but their elites are granted much rarer Intelligent Devices with more sophisticated AIs and forms tailored to their areas of specialization. Notably, Chrono Harlaown's Durandal is a mere Storage Device (though a highly specialized one, distinctly superior to what the mooks are issued), which he prefers because it processes magic more quickly than an Intelligent Device, and he is not tempted to grow dependent on its AI. Teana and Subaru from Magical Girl Lyrical Nanoha Strikers each use a Storage Device rather than an Intelligent Device, but their Devices are both scratch-built and therefore still count as Ace Customs. Black Lagoon: Revy's Weapon of Choice is a pair of customized Beretta 92 series pistols with, among other things, extended barrels. She calls them the 9mm Sword Cutlass. In Martian Successor Nadesico, Akatsuki Nagare has his own Aestivalis when he joins the crew, outfitted with a better engine and armor material than the normal Aestis. When you're the CEO of Nergal, you can do these things. The main girls of Infinite Stratos have their IS Suits customized to their fighting style, but they sometimes border on limited-production models, or outright Super Prototypes (Houki's Akatsubaki being the latter). Only Charlotte's Rafale Revive Custom II qualifies squarely for the trope, as it is based on a technically obsolete, 2nd-generation frame (everyone else's suits are 3rd-generation, Houki's suit is the first 4th-generation); she has added several modifications (such as being able to dual-wield guns and being able to store and summon more weapons) and had it repainted orange (in contrast to the green on the frame which it was based on), which comes as a great surprise to her opponents (much like her true gender initially being a secret). Technically, the Black Getter Robo of Getter Robo Armageddon is this, being a heavily modified Getter Robo. In Full Metal Panic!, Sosuke has the customized "Crossbow" in the novel "Burning One-Man Force". While it's actually an obsolete machine (a first-generation Rk-91 "Savage"), it still fits the spirit of the trope due to being tuned for his abilities and painted white and navy just like his Arbalest which was destroyed in the previous novel. The Club Presidents and the Elite Four in Kill la Kill have their Goku Uniforms (superpowered outfits) tailored to their specific clubs or fighting styles. For example, Tennis Club President Omiko Hakodate allows her to fire tennis balls at a literally machine-gun pace. Disciplinary Committee Chair Ira Gamagoori "disciplines" rule-breaking students with the many whips that sprout from his uniform, and has excellent discipline himself, as pain only makes him grow stronger. Undefeated Bahamut Chronicle has Lux Arcadia's customized version of his Drag-Ride where it's base form is a Wyvern, a Powered Armor that is capable of flight yet has nothing but a lot of things that improve defense but at the same time weigh him down heavily. Good thing he's an Child Prodigy Ace Pilot, otherwise he'd get shot down easily. As with most Mecha Genre tropes, subverted by Armored Trooper VOTOMS. Chirico does spend extensive time customizing a couple of the many Scope Dogs he uses over the course of the series, but it rarely increases their survivability. During the first arc, he customizes a junked AT by welding on many guns, with his friend painting on the iconic Red Shoulder to intimdate their opponents. A later arc has him rewriting another Scope Dog's battle computer in order to keep up with a next-gen AT model. The Millennium Falcon doesn't look like a whole lot, but due to both Han's piloting skills and the special modifications made by its previous owner Lando Calrissian and continued by Han and Chewie, it is considered the fastest ship in the galaxy. It's also far more heavily-armed than average, considering that its stock model is classified as a light freighter (albeit one specifically designed for easy modification for many different roles), not a fighter. Word of God is that every owner of the Falcon has done this, but that doesn't stop it from occasionally acting up as The Alleged Car would, as the often-improvised enhancements can be quite tempermental. Darth Vader's TIE Advanced x1 prototype seen in A New Hope is a heavily-modified version of the standard TIE Fighter. Its bent-wing design gives it a smaller profile, shield generators make it far tougher than the standard fast-and-fragile TIE fighter, and its improved engines make it slightly faster despite the added bulk (although it's somewhat less maneuverable). It's a rough match for the Rebels' famously versatile X-Wing fighter. Many of these improvements are later rolled into the next-generation TIE Avenger model, along with other advancements from the TIE Interceptor. And then of course there are the custom lightsabersnote In the old Expanded Universe, all lightsabers were custom-made to suit the owner, but some were more custom than others, most notably Darth Maul's two-bladed saber and Kylo Ren's lightsaber with the laser crossguard, although the latter is actually a result of using substandard materials in its creation (notably a cracked and therefore unstable Kyber crystal), not that it stops Ren from being able to utilize the 'defect' as a feature in his combat style. Porco Rosso's plane is the only one of its kind, as it was considered too dangerous to fly. Porco says (paraphrased) that while it's a nightmare to get in the air he thinks there's no better plane once it's flying. The police cruiser that Stitch stole when escaping the prison ship. Mack Maloney's Wingman series features numerous ace customs — the series is set in a post-WW 3 Divided States of America, so the combat aircraft flown by many of the protagonists (including the main character, Hawk Hunter) are practically their personal property. The most prominent is Hawk's F-16 (possibly the last one in the world), which gets upgraded midway through to the F-16XL variant. Goes unmentioned in the films, but the Star Wars Expanded Universe reveals that Anakin Skywalker had a penchant for this. In between Attack of the Clones and Revenge of the Sith he built an extensively upgraded version of the standard Jedi starfighter, then did it again when his first one got shot down. At other times he seems to have settled for just a custom paint job on standard-issue fighters. Paul Naughton's Valkyrie Into The Heavens series features a number of different ace customs. Set in the future, the starships that the protagonists use are cutting edge prototypes and the only ones in existence until the designers standardize the designs. Browns Pine Ridge Stories: The Custom 1957 Chevrolet owned by the Raiden Brothers in Chapter nineteen ("The Race") is described this way by Elroy. This is justified as they owned and operated an auto parts store and thus and the knowledge and best parts ("Every available Hot-Rod (sic) part from here to California had been acquired to make this the fastest Hot Rod on the east coast".) available to make their custom hot rod. However, they still lose the race as they aren't the expert race car drivers they believe themselves to be. A two-episode story on Space: Above and Beyond featured "Chiggy Von Richthofen", a enemy Ace capable of wiping entire squadrons of Earth fighters by itself. "Chiggy" flew a special version of the standard Chig fighter that had some kind of stealth technology making it invisible to Earth detection and targeting systems, was invulnerable to cannon fire, and in general displayed greater speed and maneuverability than any other fighter in the show. Also, its nose was painted with a human skull and the phrase "Abandon All Hope" (in English, so his opponents could read it). In the end, Chiggy gets taken out by a Designer Baby human ace flying a standard-issue Hammerhead fighter with half a dozen missiles. Doctor Who: Inverted (sort of) with the TARDIS, which was specifically selected by the Doctor out of a number of TARDISes because this particular one had a broken navigation system to begin with, and which has developed many more faults since. But these idiosyncrasies fit the Doctor's style perfectly, and so he manages to take what should be The Alleged Car and use it as a genuine ace vehicle. One episode in the revived series gives the TARDIS herself a chance to explain that from her perspective the relationship is kind of reversed. The Doctor is her Ace Custom Time Lord, the mad one she chose to kidnap because his eccentricities and wanderlust suited her and her desire to go out and see the universe. Done in the BattleTech animated series, and in the world setting for the original game as well. Many "ace" Mechwarriors have unique mech variants, such as Justin Allard/Kai Allard-Liao's Yen-Lo-Wang Centurion, or Natasha Kerensky's "Widowmaker" Daishi. OmniMechs, with swappable hardpoints, were pretty much specifically invented to allow players to build their own ace customs. In fact, there's nothing stopping any player or character with a Daishi to field the Victor, Hohiro, and Widowmaker configurations themselves. Subverted and then reinforced by the case of Yen Lo Wang. After nailing an astonishing five kills in his Trial of Position with Wolf's Dragoons, Ace pilot Kai Allard-Liao is offered a Dire Wolf (Daishi) OmniMech by the Dragoons. It's an unquestionably superior off-the-shelf machine. He refuses it because he feels he owes it to his father to pilot their family mech, Yen Lo Wang. No one believes for an instant that the upgraded but antiquated holds a candle to the clantech behemoth they've offered him, so it's subverted. The trope is then reinforced because the Dragoon instead completely overhaul Yen Lo Wang with Star League technology, which gives it a boost in power but still leaves it far from optimized, resulting in the mech itself actually being weaker than a Clan mech or even many Inner Sphere designs. Kai would also go on to achieve some of his greatest victories while piloting stock mechs instead of Yen-Lo-Wang, further subverting the trope. Because many 'mechs are very, very old, many warriors with older machines have had to replace too-expensive or outright lost-and-forgotten older systems and weapons with substitutes, which end up creating a sort of ad-hoc Ace Custom out of necessity. The quality of these machines varies quite a bit depending on what components were being replaced by what. This can lead to very scary Battlemechs being paper tigers because their powerful systems and weapons have been replaced or stripped, or it can lead to an awful surprise when a disreputable "white elephant" or otherwise unassuming design suddenly whips out a BFG. The Strategic Operations supplement offers players the ability to do aftermarket refits, and can significantly revamp a mech in so doing. There's also a quirks system which can represent both common features of a design or specialty add-ons to a particular mech. Mekton is capable of playing this breathtakingly straight with its highly sophisticated and granular mecha design supplements, Mekton Techbook (Mekton II) and Mekton Plus (Mekton Zeta). Maximillion Weissman had his own custom version of a Baneblade built. Functionally however it was near-identical to a normal baneblade, except for Weissman's superior crew which gave it slightly superior stats. Commissar Yarrick also has his own version of the Baneblade, the Fortress of Arrogance, which does have more noticeable modification. It was presented to him as a gift from the Adeptus Mechanicus. Tau Commander Farsight has his own Battlesuit customized with the unique Dawnblade he found, subsequently making him the only tau unit dangerously competent in close combat, which suited his bloodthirsty tendencies. Asdrubael Vect can get a custom ravager/raider called the Dais of Destruction that packs 3 dark lances, armor 13 all sides, and a transport capacity of 10, meaning it will ruin someone's day quite nicely (if a more than a little expensive at 240 points for Vect and another 200 for the Dais). Ciaphas Cain (HERO OF THE IMPERIUM!) gave a sniper his own weapon back on a Trading Bars for Stripes mission, noting that the adjustments they make to their weapons makes them a lot more effective in combat. While everything an Ork Mekboy builds can be classed as a custom job, the Meks personal conveyance will be a truly unique piece. Whether it is a Warbike, Buggy, Speedsta, Deffkopta, Battlewagon, Wazbom Blastajet, Morkanought, Stompa or Gargant, the vehicle that a Mekboy builds for himself will typically be festooned with a plethora of powerful, if temperamental, experimental weaponry and equipment such as Kustom Force Fields, Lifta-Droppas or Destrukta Rokkits. Of particular note is the Bike of the Aporkalypse, a heavily kustomised warbike ridden by the Bad Ork Biker Mek Wazdakka Gutsmek that he is constantly tinkering with and upgrading. The exact rules for this warbike tend to change with each edition of the game but they always include a large and powerful ranged weaponnote which was a battle cannon in 2nd Edition and a Dakkakannon during 4th Edition and with massive recoil. Some of the Primarchs wore custom built armor (Horus' Serpent's Scales, Perturabo's Logos) or rode their own personalized vehicle (Perturabo's ShadowSword Tormentor). In-game, the concept of the Customizable HQ is this for the characters; prior to 4th edition all special characters required your opponent's explicit permission to use and you were encouraged to use the generic HQ to build someone to represent you on the battlefield. 7th Edition is trying to return to this trend by giving a lot more customization to the generic =[H Qs=] and restricting some of the utility of named characters. Emphasis on trying, as a lot of the options are just flat out better than others, leaving players to just choose the best loadout possible, which isn't exactly hard to find. The CAMELOT Trigger setting for the Fate Core System provides a bit of a twist: not only can knights have their own armour customized as in many other mecha-based games, the rules also distinguish between equipment that endows the armour with skills of its own and equipment that instead gives it special "tricks" and situational boosts. A suit of armour with good relevant skills will perform well in the hands of even a less gifted user because it can substitute its own skills for theirs if need be (at least until the relevant system goes offline), but an actual "ace" is probably better off with more dedicated special purpose gear and less redundant automatic assistance...which then of course means that if a novice ever ends up having to pilot the same suit, they're that much more likely to be hopelessly lost. WARMACHINE: Played with. Warjacks themselves may begin to develop skills and personalities overtime, becoming an "ace", with the commander customizing it to better make use of its own skill. Played straight in the case of some other character warjacks, which may not have developed skill in the field but been specially built for a warcaster. Like Nemo's Dynamo, Strakov's Torch, and Reznik's Scourge of Heresy. With her recent promotion to Kommandant, Sorscha Kratikoff has gotten an Ace Custom suit of Man-O-War armor designed for her generally more mobile combat style and slighter frame than the standard pilot. The model looks somewhat odd unless you realize the MOW armor is really a mini-mecha and not simply a suit of steam powered armor. This is one of two reasons why Title upgrades exist in X-Wing Miniatures. Any Title card with a dot (marking a unique upgrade rather than one you can bring multiple copies of) represents a ship that's been customised by its owner. Rules-wise you don't have to equip the Title to the named pilot, and on the tiny number of ships with multiple unique Titles you can even do weird stuff like have Boba Fett and Emon Azzameen show up flying each other's Firesprays, but the modifications are generally associated with the pilot they're thematically linked to - Andrasta ties into its pilot's bomb-heavy focus, while Poe Dameron's Black One combos with both his squadron leader status and the barrel rolls his astromech, BB-8, lets him do. Warbirds Ace Pilot player characters are generally assumed to be employed by the Guild, which starts by rebuilding a standard fighter with titanium and high technology ("high" in this case generally means "1950s-60s") and then letting the player loose on the options menu. In more straightforward games this might include weapon or engine upgrades; ones using, for example, the mad science sourcebook might culminate in the squadron kook upgrading his kite with a dangerously overclocked laser cannon that will explode if things go even a little bit wrong. The Original Generation mecha of Super Robot Wars is overloaded with Super Prototypes and Ace Customs, there's far too many to mention. Ace Combat occasionally has custom paint jobs used by enemy Ace Pilots. Frequently, you can use their paint job if you defeat them. Captain Bartlett of The Unsung War and Viper of Infinity are both pilots who are known by their heavily customized (and old - Vietnam-era F-4G and MiG-21, respectively) planes. In some of the games, particularly Infinity, you can do this yourself with various parts you can customize your plane with, and occasional paint jobs from random drops. There are likewise special planes, frequently modeled after those flown by notable characters from previous games or noteworthy paint schemes from the real world, which usually have higher base performance than the standard version alongside the unique paint scheme and more space for custom parts to make it even better. Throughout the Valkyria Chronicles trilogy, special Aces appear in many missions with custom weapons. Taking them down usually gave you that weapon or their blueprints in return, for you to use for yourself. Technically, this could also count for your own upgraded weapons, as you usually have the option to change weapons over to another spec type in its tree (such as a gun that lowers an enemy's defenses or one that performs better against armor). Getting technical, any of the titular mecha from Armored Core are ace customs. Each one is a specially built engine of destruction that accommodates the pilot's fighting style and can wield an astounding array of weaponry. Also, when Armored Core 4 appeared, mass production models of Cores appeared as mooks— Normals. The newer NEXTS now being the weapon of choice for Ravens, err Lynx. The M1911A1 Custom used by Big Boss in Metal Gear Solid 3: Snake Eater. When he receives it, he goes into extensive detail about the number of modifications to it shortly before making his own: carving down the grip to make it easier to wield his knife at the same time in CQC. Old Snake in Metal Gear Solid 4: Guns of the Patriots gets his own in the M4 Custom, named so for the ludicrous number of extra parts he can attach to it, from sights and suppressors to underbarrel grenade launchers or shotguns. Xenogears uses this trope a lot, especially in the first disc. Named characters' Gears tend to be unique models custom-built for the pilot, while mass-produced Gears are used by Mooks. However, in the latter half of the game, many of the heroes trade in their personally-customized Gears for Lost Magitek with superior capabilities. While Xenosaga's E.S. (Ein Sof) units are primarily Super Robots due to them resonating with Vessels of Anima (hence Ein Sof meaning "infinite" or "unending", words that you'd normally apply to the aforementioned Super Robots), they seem to be built, designed, and most especially customized to reflect their respective pilots and their fighting styles. For example, E.S. Asher seems to be built for ranged ballistics similar to Jr. himself, E.S. Dinah is all about energy weapons like KOS-MOS, E.S. Reuben wields swords like Jin Uzuki, and E.S. Zebulun is primarily an ether wielder like MOMO. Mobile Suit Gundam Side Story 0079: Rise From The Ashes: Technically, all the White Dingo units are superficially ace customs, as they are painted in the White Dingoes custom color scheme of dark gray-on-gray. However, their performance is no better than a standard production model. However, their version of the GM Sniper Custom II does have additional modifications to the base model, specifically Vulcan gun pods not seen on other versions. The only completely uncustomized machine used by the White Dingoes is their support unit, the Bloodhound. Custom Robo is, as the name suggests, all about ace customs. Sword of the Stars features an ace custom flagship, a jacked-up CnC mission fused with a barrage mission. It costs a fortune, and you can only have one at a time. Oh, and losing one hits your morale harder than having something death star a major colony. The main characters of Danball Senki all use special LBX, either customized by themselves or done for them by prominent LBX producers (justified as good players are hired to test new products). Yasha from Asura's Wrath has a jet bike called the Lone Wolf: Corvette, that has the power of the other deities Septentrion flagships, with speed similarly fitting for his fighting style. The MechWarrior series has the MechLab, allowing players to heavily customize their Humongous Mecha to their liking. Some loadouts will simply adjust the armor distribution or how much ammo is carried for each weapon, while more extreme loadouts will share nothing in common with the original loadout; such as a player turning a long ranged missile support mech into a closed range brawler loaded with dumbfire rockets. In the singleplayer games, the bosses generally have Ace Custom loadouts on their mechs, and sometimes the Elite Mooks as well. Online also enforces this, as some updates introduce "Hero Mechs" and/or "Champion Mechs" that have different loadouts (and other bonuses in the case of Hero Mechs), along with a bonus towards earning XP and C-bills for using those Mechs. Hero Mechs often boast loadouts and hardpoint configurations unlike most canon variants seen in the tabletop game (though modified versions of unique canon units are present, such as the Yen-Lo-Wang and Aleksander Kerensky's Orion), while Champion Mechs use loadouts popular with the community/meta-game. Hero Mechs also come with unique paint colors and patterns. The MechLab also shows up in Battletech, working in much the same way. The Final Boss of the game also uses a slightly modified stock King Crab. Anarchy Reigns have a pilotless example in Garuda, a Transforming Mecha based on the Gargoyle robot. However, while Gargoyles normally have plasma arms fit for ranged combat, Garuda possess a pair of drills instead for close-quarters combat to better fit his partner who prefer blasting enemies from afar with his revolver cannon. Several of the unique weapons in Fallout: New Vegas. Some of the notable ones include: Lucky, a long-barreled .357 Magnum revolver with gold etching and an ivory grip inlaid with a club symbol; Maria, a customized 9mm pistol decorated with the image of Our Lady of Guadalupe, used by Benny; the Survivalist's Rifle, an old Service Rifle chambered for 12.7mm ammo; A Light Shining In Darkness, a compact .45 pistol with a custom hammer and sights, a snakeskin grip, and an inscription of a passage from The Bible, used by Joshua Graham; and La Longue Carabine, Corporal Sterling's scoped cowboy repeater rifle. Fallout 3 has a number, including the Reservist's Rifle, Dave's hunting rifle Ol' Painless, the Blackhawk revolver owned by Agatha's late husband, Sydney's 10mm Ultra SMG, Ronald Laren's Kneecapper sawed-off shotgun, and Smilin' Jack's Terrible Shotgun. Fallout 4 plays it several ways. Any weapon can be souped with a number of mods that are reflected with cosmetic changes. Legendary weapons are weapons with rare intrinsic modifiers than can't be crafted, which aren't reflected in appearance. However, some legendary weapons are actually regular weapons with legendary, one-of-a-kind mods that 'do' change appearance, like Kremvh's tooth, a machete of eldritch nature with a misshapen blade that can be removed and added to another machete, even a legendary one, and Lorenzo's Artifact, a gamma gun with a unique muzzle piece. Then there are some legendary weapons that have a unique appearance, like Atom's Judgement, a super-sledge with several bottles of radioactive material rigged to the head. And then there are weapons like the silver machine gun, which is just a tommy gun with a one of a kind silver-finish. The Last Remnant utilizes this method with both weapons and skills. SD Gundam Capsule Fighter does this, allowing players to modify stats to make their units hit harder or move faster. A lot of times, though, it's just to make you die in one hit. Star Trek Online does this with their starships. From the ship's outside look to the payload to the shields and engines, no two ships are actively alike. A villainous example of this is General Hakeev's ship, the Khnail, a D'Deridex Romulan warbird. When you first see it, it's a normal D'Deridex. The second time you run into it, it looks like your usual player Ace Custom with a few Borg gear. The third time, you find out that he's outfitted his entire ship, inside and out, with Borg technology that it no longer looks like a D'Deridex, it looks like the Narada. You scrap his ship during this third encounter and when you run into him again during a later mission, he's back to a normal D'Deridex. By X3: Terran Conflict the Pirate Clans have put several custom-built ships into limited production for their Ace Pilots, the most dangerous of which is the Blastclaw M3+ heavy fighter - a heavily shielded, extremely deadly ship carrying up to four fusion torches capable of roasting ships in seconds. There's even an extremely rare Super Prototype version, which is even faster and better shielded. Regular Pirates have to make do with salvaged ships, albeit customized with sweet Nose Art. Standard Pirate customized ships are actually worse in terms of overall stats, but can mount a much wider assortment of weaponry than the vanilla ships. A rare non-weapon variant of this trope is present in the semi-realistic flight sim Sky Odyssey. At the end of each mission players are given parts to customize their aircraft. How much you can buy depends on how well you scored in the previous mission. Players can also give their aircraft custom emblems, paint jobs, and names as well. The admirals of the Valuan Empire in Skies of Arcadia all have Ace Custom versions of the Valuan airships, designed to accommodate their favoured battle tactics. In addition there's the Delphinus, intended to be the royal flagship of the Valuan armada and both an Ace Custom and Super Prototype for the smaller 'Spectre'-class battleships. Naturally, the heroes nick it, ensuring they have the fanciest ride in the game. Or rather, are handed it on a silver plater by the prince who would rather it be used to fight his mother. Warframe has three kinds of this, depending on the faction that built it; Grineer Wraiths, Corpus Vandals, and Tenno Primes. Wraith and Vandal customs are limited to gifts for reaching certain point levels during events, making them lost forever if you fail to get them before the event ended, while Tenno customs require Item Crafting. The Wraith and Vandal weapons are now being added back into the game as part of the rewards for Invasion Missions, so it is now possible to obtain them if you missed the event. Obtaining them this way, though, requires Item Crafting, as only the components are given. Also, there is now a third type of Ace Custom: Dex weapons, Lotus themed weapons released as anniversary awards for the game. Finally, the Tenno have another type of Ace Custom, at least in regards to Warframes, known as Umbra, who are as powerful as, if not better than, the Primes. In fact, this is a subversion, being not only a Super Prototype kind, but heavily hinted to be the original users instead of only their armor. Thanks to this, they also have an unique "autopilot" mode. In Shadowrun: Hong Kong, Racter is a unique take on the Rigger in that instead of being able to switch between various off-the-shelf drone models, he instead has a custom drone called Koschei that can be modified in capability as the game goes on. Jetstream Sam from Metal Gear Rising: Revengeance, being the only (mostly) human enemy in the game, not only has a custom blade that can cut through nanomachine-based armor,note His sword is noted in particular to be one of the best high-frequency blades in existence at the time of the game, specifically because it's been converted from an existing, high-quality sword, rather than the sort of mass-produced things that Raiden in the prologue or the various other mooks across the game use but also a mechanical sheath for it that ejects the blade at high speeds, allowing him to draw (and, by extension, strike) fast enough to match the speed of the near completely robotic Winds of Destruction. He barely even needs it to disarm Raiden at the beginning of the game. In Mercenary Kings, you can make your own custom gun when you are able to craft certain parts, resulting in bizarre-but-effective frankenguns like a scoped magnum pistol with a shotgun drum barrel and an assault rifle stock that fires mini-homing missiles. In XCOM 2, weapons can be customized with attachments and colors. A Rookie might just have a bog standard assault rifle, but your alien-slaughtering Colonel gets a neon pink shotgun with a critical-hit seeking laser sight, advanced stock, and expanded magazine. In the War of the Chosen Expansion Pack, the Chosen use one-of-a-kind weapons based loosely on standard ADVENT tech. The Hunter, for example, has a railgun with an advanced targeting computer, while the Warlock gets an assault rifle that deals extra damage against psionic-sensitive entities. The Spartan-IIIs of Noble Team, as they are seen in Halo: Reach, qualify as Ace Customs among their fellow Super Soldiers. The SPARTAN-III program was an attempt to create "mass produced and expendable" versions of the SPARTAN-II super soldiers; they wore Semi-Powered Infiltration armor, which was less advanced and powerful than the MJOLNIR suits used by by the IIs, and mostly received chemical rather than surgical augmentation. However, Spartan-III recruits who had the genetic markers required for successful S-II enhancements were separated from their companies and given longer, more stringent training, SPARTAN-II augmentations, and MJOLNIR armor. Invoked with 3-Times and Masa in Super Cosplay War Ultra. Being the game's Char Clones, 3-Times is a more powerful red-colored version of the standard rank-and-file Zaku mooks, and Masa basically is Char wearing a red suit of Zaku armor and sporting an expanded moveset. Chou Dengeki Stryker: By inserting various "Stryker Drives" (named after Japanese aircraft) into their gauntlets, a Stryker-series cyborg can manipulate electricity for various purposes such as a Laser Blade, Arm Cannon or Super Speed. In the Steel route, Stryker Zero notes that the vulnerable period when switching between Drives is one of the system's biggest weaknesses, and commissions a custom "all-in-one" unit to eliminate it. The resulting Drive, Kamui, ends up including a substantial power boost as well, but at the cost of being calibrated for Zero's older hardware, limiting its use to him alone. Though there are no mecha in the setting, tanks in The Solstice War seem to be borrowing from this trope. Noel's Strike Ranger tank was a prototype designed to cater to his tastes in tanks. The e-frames given to Able Squad in Exo Squad were all modified versions of the usual models, testing new features which inevitably turn the tide in the first battle they are used in. Phaeton's personal Command E-Frame is capable of shrugging off direct hits that would destroy a normal E-Frame. He later has it further customized with medical equipment to help treat his automutation syndrome. This was the ultimate fate of the Megas XLR unit: though it started as a stolen Glorft Super Prototype, it was so heavily modified by Coop (with junkyard car parts and old video game consoles no less) that he became the only person able to actually use the thing, as opposed to its intended pilot, Kiva. Sym-Bionic Titan: Ilana's mech, Corus, is implied to be this since no others like it were ever shown. Lance uses a standard issue Manus armor with a slightly different color scheme; the Combining Mecha aspect probably isn't standard, though, since the King passed him a new model (his old one had been confiscated) before sending him off. Star Wars Rebels introduces gear seen in the original trilogy that is in either an unmodified or base form, or things that have never been seen before. The TIE Advanced prototype, used by Inquisitors, as well as Vader's TIE Advanced x1; the TIE Bomber and Interceptor, Ezra's hybrid saber-blaster, the Inquisitor Lightsaber (a spinning saberstaff), and the prototype B-Wing fighter. Its previous series, Star Wars: The Clone Wars introduced a new lightsaber to the mix - the Darksaber: a black cored saber modelled after a katana, complete with diagonal edge and flattened blade. Gentoo Linux is aimed at people who want to do this to their whole operating system. And for people who don't want to compile all their programs from source, there's Arch Linux . Some Imperial Japanese Navy pilots flying Zeros out of Rabaul during World War II ordered simple armor plate welded in around the interior of the cockpit. They were a minority but towards the end, the only ones left. Perhaps uniquely for the concept of Ace Custom, they performed worse than the basic model... but were more likely to bring their pilots back to base. B-17E 41-2666 "Old 666" was an Ace Custom Bomber. Namely, the crew took the already Dakka-filled B-17, and up-gunned it, with a fixed machine gun in front for the pilot, 2 for the waist-gunner instead of one, and upping all the .30 caliber ones to the larger .50 cal. They also loaded up extra machine guns so that if one jammed they could just dump it out the side and strap another into place instead of taking time to clear the jam. All this came into play when Old 666 was on a mapping mission, alone, and was attacked by 15 Zeroes and 2 other planes. With 20 more minutes left in their mapping mission, the crew choose to simply dogfight the entire swarm of zeroes while still mapping. It worked. Carlos Hathcock, a US Marine Corps sniper during Vietnam (who wore a giant white feather in his bush hat), built a custom bracket to mount a 10X Unertl scope onto an M2 Browning machine gun which he used for several confirmed kills (including one at 2500 yards).note In a sense it could also qualify for the usual application of Super Prototype - later, dedicated sniper and anti-materiel rifles chambered in the M2 Browning's .50 BMG round were created simply because Hathcock and other snipers proved the round worked pretty well in that role. The German Luftstreitkrafte offered experienced pilots far more leeway in customizing the paint jobs of their planes than the Allied nations. While most French and British planes had plain green paint jobs with the appropriate national and squadron insignia, the Germans had all manner of weird and wonderful color schemes, with aces' and squadron leaders' planes often having a completely unique appearance. During World War I, the "Red Baron", Manfred von Richthofen, became one of the most famous users of an "ace custom" with his bright red Albatros D.III with a reinforced spar on the aircraft's lower wing. The rest of his squadron similarly customized their planes, resulting in their becoming known as "the Flying Circus." The Mallard, the locomotive that broke the speed record for steam trains and has held it ever since, incorporated a number of tweaks to its design that made it an improvement over other engines of its class. Its designer, Nigel Gresley, always intended it as the record-breaker. Both studios owned by Yoshiki Hayashi (the old One On One Studios he bought from Bob Rock of Metallica fame before he sold it, and the new one built from scratch) are the musical version of this. While a variety of different artists have used him as a producer and recorded at both, both were constructed to be specifically useful to the needs of his own projects, including X Japan and Violet UK. Soviet Air Force customarily removed the wing guns off the Lend-Lease Bell P-39 Airacobra fighters, leaving only the 37 mm cannon and two 12.7 mm machine guns in the nose. This both lightened the airplane and improved its manouevreability, making it able to turn tighter than any German aircraft at low altitudes, and the 37 mm Oldsmobile gun was more than enough to bring any opponents down. Airacobra was the preferred plane of many Soviet aces, including the second-highest scoring Aleksandr Pokryshkin (59 kills) and third-highest scoring Grigori Retchkalov (57 kills). An example which falls under both Real Life and Video Games; Unless you are mobile enough that you have to buy gaming laptops, any PC gamer knows the best option is a custom rig (companies like Dell's Alienware subsidiary or Falcon Northwest skimp on things and are overpriced) and either learn to put it together or learn how to pick the right parts and pay someone to assemble it for them. This is split 50/50 with Super Prototype due to each machine being so unique that they are the first (and likely only) one of its kind, however. What does fit the trope are external cases (the only part you normally see of the "tower" that stores the actual computer parts, basically the "skin") which range from mildly stylized budget cases, to heavily stylized futuristic ones that cost $100-$300, to the bland and cheap but sturdy and well-made boxes which people like to modify so much that you'd never believe the Steam Punk Babbage device, the PC disguised as a LEGO product, or the beige e-Machines box with the Pentium sticker and coffee stain on top was able to run the Star Citizen alpha. Many professional musicians, guitarists and bassists in particular, use custom-made instruments because they suit their playing style better than what they can find at Guitar Center. Overlaps with Limited Special Collector's Ultimate Edition: Many automakers will offer special editions of some of their performance or luxury vehicles. Options exclusive to these vehicles can include special badging and paint jobs, performance upgrades, and matching accessory items. The latter can range from specially branded clothing and luggage, to special tools and spares for track use, to access to exclusive racing schools and track day experiences. Additionally, the vehicle may be individually numbered, particularly if the manufacturer announces a specific figure for how many of such vehicles will be made.